GMO and Organic products fill most mainstream shops. GMOs are largely present in processed food while natural ingredients are used in making organic food. Although there are currently conflicting studies on the pros and cons of their impact on humans’ health, there is generally more controversy associated with GMO. The following discussions further delve into such differences. GMO or genetically modified organism is the product of a laboratory procedure which involves artificial combination of differing genes; hence, a similar term, “transgenic” organism, is also used. The DNA may originate from animals, humans, insects, viruses, and bacteria. There is a very high guarantee that you have already consumed GMOs as they are found in almost all kinds of processed food. Some of the GMO crops in the United States are squash, canola, cotton, and soy. The first GMO created was created in 1973 by Herbert Boyer, a researcher and entrepreneur, and Stanley Cohen, a geneticist and Stanford professor. A bacterium resistant to kanamycin, an antibiotic was genetically engineered. This development was succeeded by a genetically modified mouse in 1974 by Rudolf Jaenisch, an MIT professor. After almost a decade, the first genetically modified plant was created in 1983 which progressed to the first commercialized genetically modified tomato which was released in 1994. GMOs cost less since their massive production is easier to maintain. Also, fewer pests invade such crops due to the modification. Though GMO has yielded significant economic gain, it has also been infamous for causing adverse health effects such as allergic reactions and even cancer; thus, the moniker, “Frankenfoods”. It must also be noted that there are conflicting studies regarding the pros and cons as some researchers conclude that GMOs do not pose health risks for humans. Organic is the description for products which were not processed and yielded through chemical-free fertilizers and pesticides. Though farming has been organic since its earliest practice, the movement for organic agriculture started in the 1940s as a reaction to industrialized farming. Specifically, Lord Northbourne coined the term “organic farming” in 1939 when he wrote the book, “Look to the Land”. Organic food is preferred due to its advocated health benefits as it is free from artificial ingredients and unnatural procedures. However, such produce is more expensive due to its higher maintenance cost and less harvests. Moreover, some researches are implying that consuming organic products does not significantly improve health. Organic products are usually more expensive as compared to GMO ones due to the maintenance cost and yield. For instance, a pound of regular lettuce costs 2 dollars while an organic one costs 3 dollars. The price of organic food is said to be 25% to 50% higher than their regular counterparts. GMO have altered DNA (which may come from animals, virus, or bacteria) while organic ones retain their original genetic makeup. It usually takes more effort and finances to maintain an organic farm due to their higher vulnerability to pests, diseases, and harsh weather. On the other hand, GMO crops are more resistant to pests and diseases. Also, GMOs are often designed to have higher production and reproduction rates. Food and farming have already been organic since its advent while first GMO plant was created in 1983. 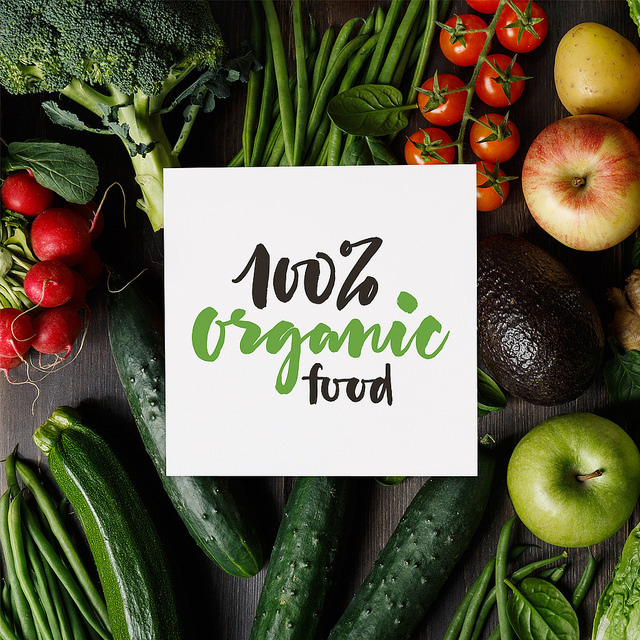 There are many non-government organizations known to advocate non-GMO foods and the National Organic Program by the United States Department of Agriculture (USDA) facilitates the certification of organic produce. On the other hand, there are no highly known organizations which advocate GMO foods and facilitate such specific certification. 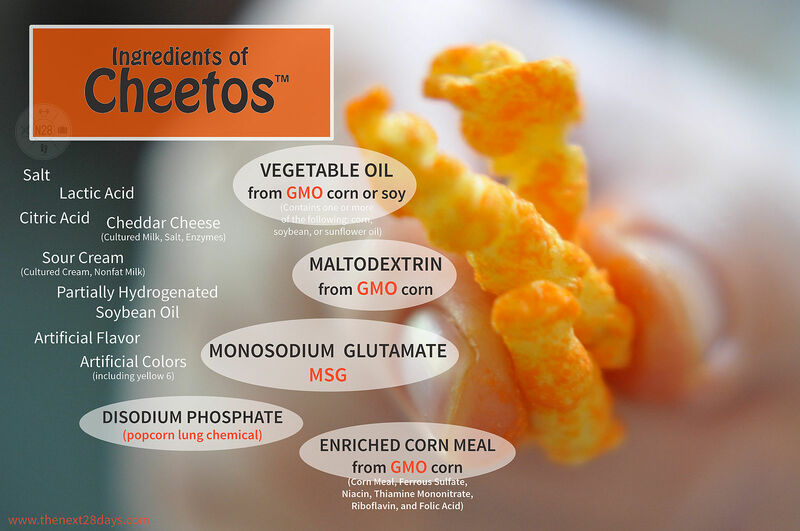 There are more controversies associated with GMO products due to health concerns. Several experiments concluded that mice which consumed GMO food were more likely to suffer from illnesses as compared to those which ate organic food. Hence, some countries such as Greece and France have banned GMO food from their markets. As compared to GMO crops, the organic ones easily go bad as their decomposition rates were not genetically engineered. Also, organic fruits and vegetables are not sprayed with chemicals that is why they are less resistant to bacteria and other agents of decay. Moreover, organic food does not have preservatives or related chemicals which delay spoilage. Surveys have shown that there are more Americans who are willing to spend on organic products than cheaper GMOs. Apparently, many consumers are concerned about the possible negative impacts of transgenic organisms. As compared to organic goods, GMO products are linked with more ethical concerns as some feel that scientists are “playing god” by altering the natural DNA of plants and animals. Some organizations are also concerned with the application of such technology on human lives. GMO and Organic products fill most mainstream shops. GMO or genetically modified organism is the product of a laboratory procedure which involves artificial combination of differing genes. Organic is the description for products which were not processed and yielded through chemical-free fertilizers and pesticides. Organic products are usually more expensive as compared to GMO ones. It usually takes more effort and finances to maintain an organic farm. There is more controversy associated with GMO products due to health concerns. The first GMO plant was created in 1983 while agricultural products have been originally organic. As compared to GMO crops, the organic ones easily go bad. Surveys have shown that there are more Americans who are willing to spend on organic products than cheaper GMOs. As compared to organic goods, GMO products are linked with more ethical concerns. gene balinggan. 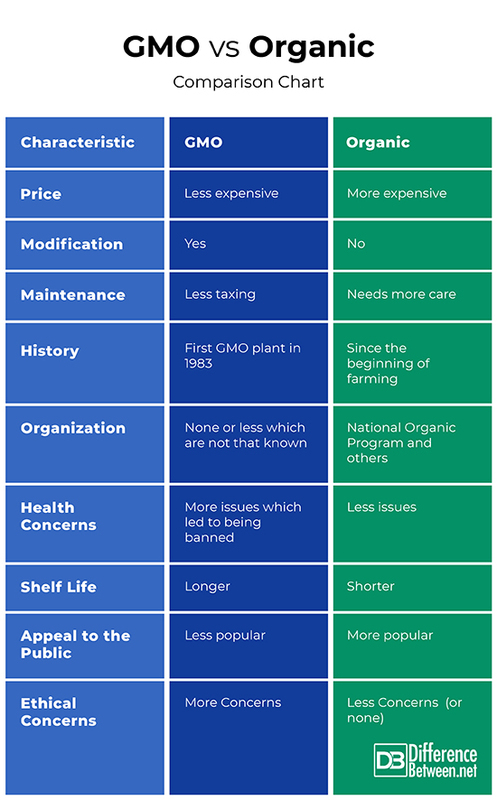 "Difference Between GMO and Organic." DifferenceBetween.net. April 1, 2019 < http://www.differencebetween.net/object/comparisons-of-food-items/difference-between-gmo-and-organic/ >. Druker, Steven. Altered Genes, Twisted Truth. Salt Lake City, UT: Clear River Press, 2015. Print. Knoepfler, Paul. GMO Sapiens. Danvers, MA: World Scientific Publishing Co. Ltd., 2016. Print. Lynas, Mark. Seeds of Science: Why We Got It So Wrong on GMOs. London: Bloomsbury Sigma, 2018. Print.